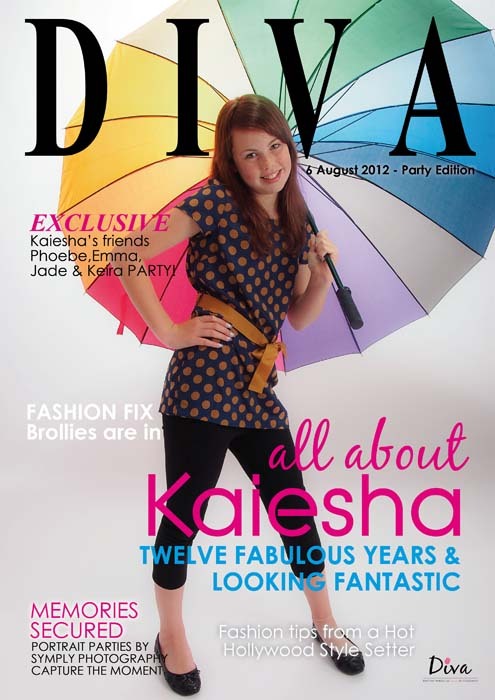 We held another of our incredibly popular Diva Portrait Parties for 12 year old Kaiesha the other day. She brought along 4 of her friends – Phoebe, Keira, Jade and Emma – and a gorgeous birthday cake in the style of GHD’s! We have taken the phone number of the very talented lady who made the birthday cake as I think it would be nice to be able to offer cakes if anyone wanted them. The girls had opted for the makeover session before the shoot started and Kat our make up artist did a beautiful hair and make up pampering session on them. The make up is always appropriate for the age, and the hair is either crimped, curled or straightened depending on the individual girl’s request. Following the makeover we started on the shoot – the ipod was switched on loud and then we showed the girls some basic modeling poses that show them off to their best . The girls soon got into the swing of the shoot and there was lots of giggling as they watched each other strut their stuff. Photos they didn’t like were eliminated immediately so that they were left with a set they were truly proud of. Once the shoot was finished they went downstairs to the party bar where there was a platter of party food, soft drinks , party poppers and the big screen projector waiting for them. They opted to watch music videos on the big screen – and of course the disco lights. In the meantime we set to work on producing Kaiesha’s magazine cover, and printing out the group photos of the girls. A stunning finale to the party was a surprise for the girls – (no I’m not telling!) . All their photos have gone onto a private password controlled website so that they can show their family and friends. Judging from all the lovely comments they have sent me on Facebook I think Kaiesha’s 12th birthday party has gone down very well!